I'm hoping someone might have a little information on this stone and let me know if the person I picked these up from was correct. These pieces came from an old collection from the 70's and they recently came to me. I was told that they were Wyoming Jade. But finding information on it has proven itself to be difficult. They are mostly olive green with small black speckles and now and then you can see the pyrite. There are a few that have whiter areas. If anyone has any ideas or thoughts on this, I would certainly appreciate it. 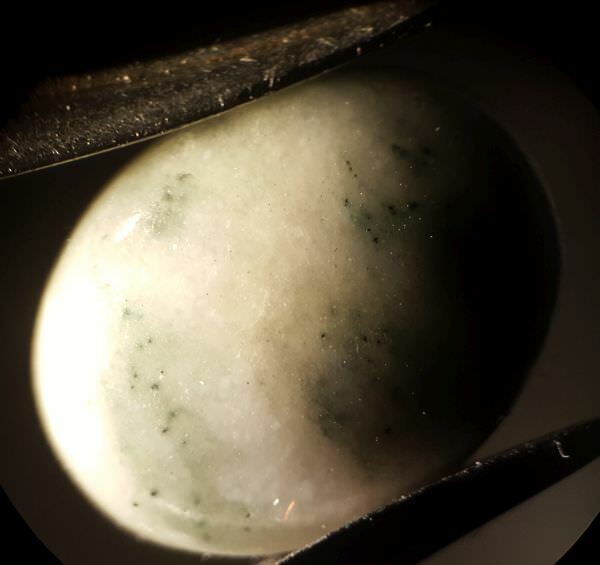 File comment: Not the best picture but it shows the green when the light is behind the stone. File comment: You can see the specks of what I assume is Pyrite on a few of them. I have collected a fair amount of Wyoming jade, both as a child and more recently. None of it looked like that. that said, I think I have recently seen something similar, if I can just remember where --- I think it was something that Lenny Samuelson was selling. I'm glad to hear from someone who has actually done some collecting. 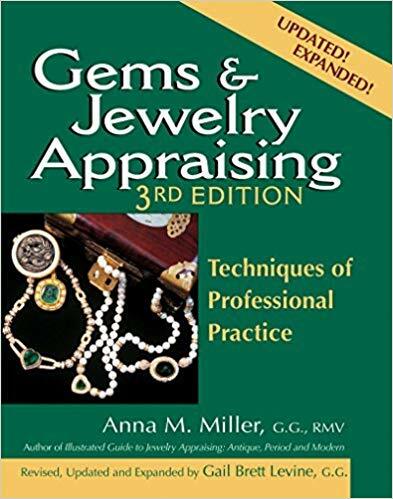 If you can recall at all where you might have seen it, I'd really appreciate it as I'm sitting on over 1000 cabs and it's really important to me that I'm not misleading anyone on the gem type. 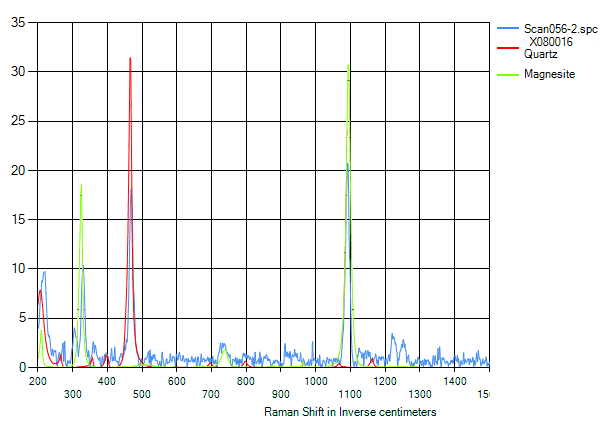 Why don't you see if someone with a Raman will test a piece for you? I was able to reach out to Lenny who is going to take a few for testing when he can. It'll be interesting to find out anything that can be found out about them. 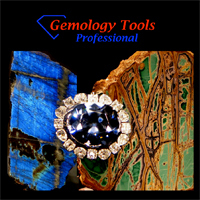 I agree - send it to someone with a Raman and get it identified if you are going to sell it. Oh cool. Lenny lives relatively nearby and comes by semi regularly so we can have a look at them too. There you go, North V. I see your mystery as promptly solved. 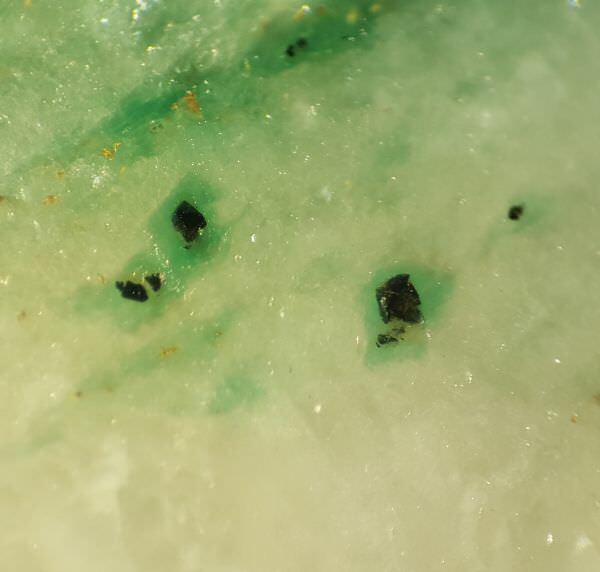 I just got a package in the mail today from Lenny containing five green cabochons with flecks of pyrite. At last! He had a look but it didn't ring any bells, aside from not quite looking like any jade he'd seen. My reaction was about the same. 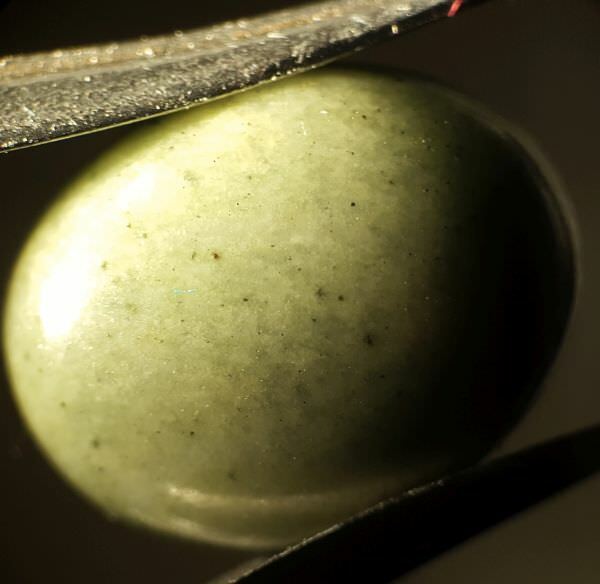 The five cabs range from an even light green to a mixture of darker green and white zones, with pyrite cubes mixed in. 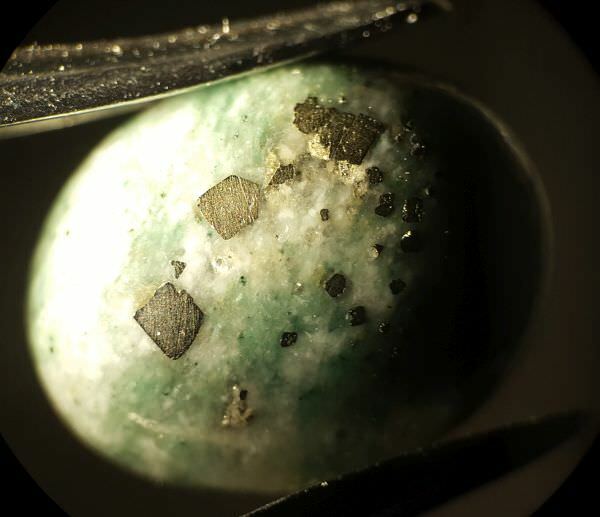 In microscopic view they show a white or greenish-grey background--rich green zones surround small dark inclusions. It appears to be around hardness 6ish, scratching apatite but not quartz, about even with the feldspar I tried it on. This was definitely not the result I expected, and I'd be very curious if anyone else has run into this kind of material before (or if they have a different idea as to its identity). 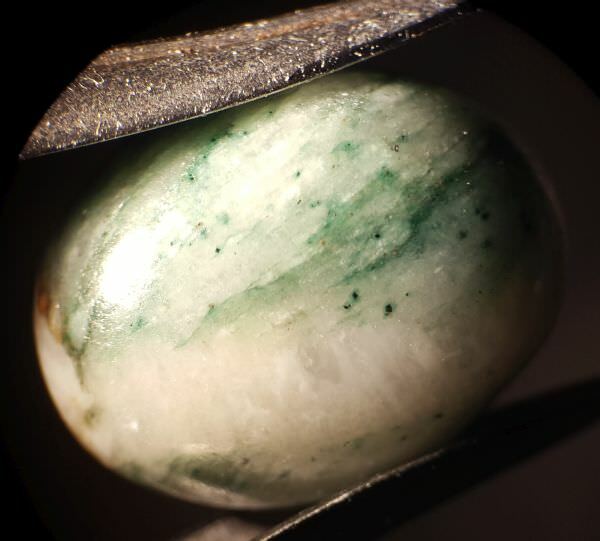 I have seen similar looking material that was Guatemalan jadeite/omphasite. 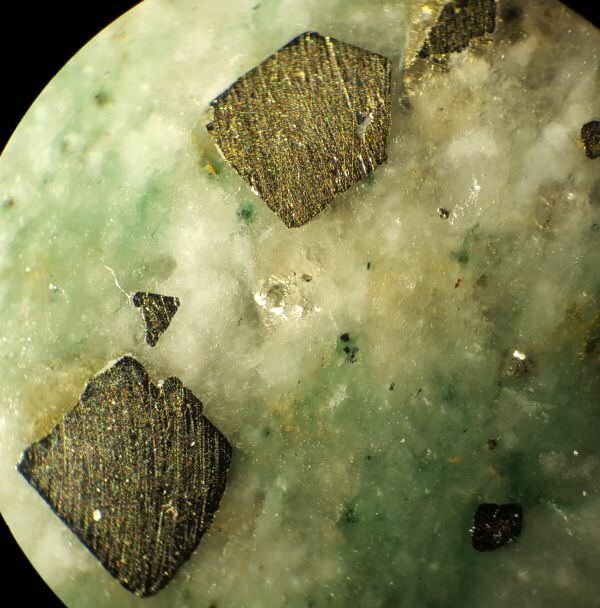 Pyrite inclusions were typical in the very dark green Guatemala jadeite called "Galactic Jade". That doesn't surprise me--pyrite shows up in a lot of different contexts. 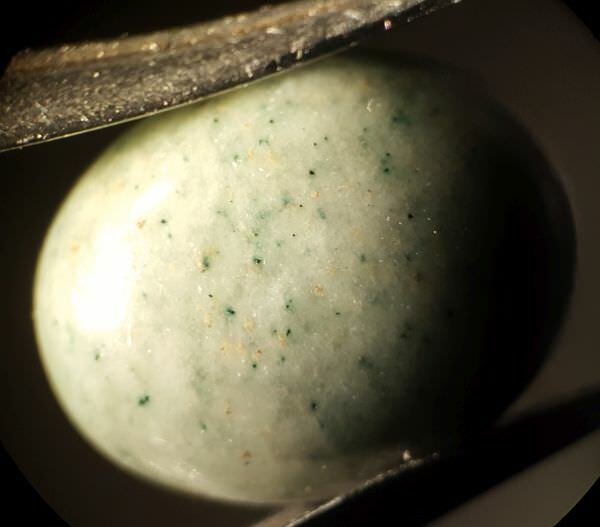 This stuff does have a bit of a jadey look (including some nice roiled texture under the scope), but the spectrum does seem to eliminate both kinds of jade. 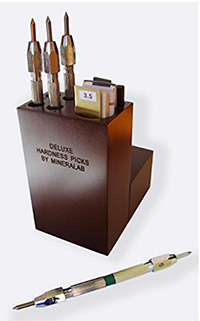 No pyroxenes or amphiboles are a good match. Apologies it has taken me a while to reply here. First.. Thank you so much for all this great investigative information! Seeing the cabs like this, is really interesting! I really appreciate this. So.. from what I'm understanding, although it's still showing as Magnesite and Quartz there's still a mystery in here it sounds like. I'm not sure what to label these as quite yet and what something like this is even worth. There's very few examples that I can dig up for reference. This is certainly a head scratcher it seems. Barbra did some analysis as well that came to similar (though more detailed) conclusions. This material is unusual, but I think we can be pretty sure it's mostly carbonates of one sort or other, and not something either of us had run into specifically before.